She stands alone, buildings towering above. The city, engulfed in light, moves beneath and around her. Her body, in what seems a momentary stance is mostly covered. Only her face and bare hands show beneath the losely draped fabric. Read as an everyday street scene, this image may not arouse suspicion or even much close attention. But what appears as deceivingly simple may in fact be a product of those things that take place behind the scenes and beyond the camera’s immediate gaze. The work of visual sociologists and skilled photographers encourages us as viewers to take into account both what we can and can’t see in a picture—the slight lift of her leg (Is she about to leave? Are people waiting for her?) or the bus zooming by (Did she just miss her trip away from there or is she comfortably plotting her next move?). Also, does her attire suggest that in her movement, or even stillness, that she’s bound by certain beliefs or principles? Or in her presence against the grit of the city, the traditional and modern neatly juxtaposed, does she challenge that association? While the image itself does not provide any simple answers, it reasserts many of the complicated features of our globalized existence. As beautifully illustrated in Rachel’s photographs, globalization alters the relationship between the individual and society: basic goods travel miles to reach our homes and ideas flow across boundaries at unprecedented rates. We could say, then, that globalization is partly responsible for the woman’s presence on this New York City street corner. But we must also consider that in enabling the movement of people, ideas and cultures and in placing this woman on a busy street or putting Pepsi advertisements along a Guatemalan lakefront, globalization gradually allows for places to take on similar visual scripts. 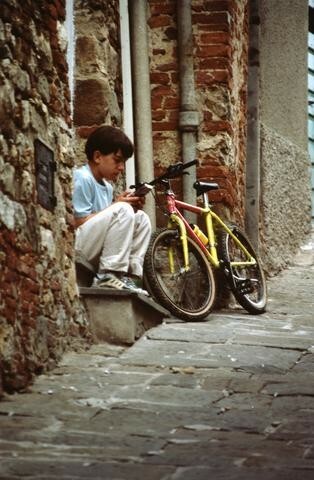 It draws the distant closer and in doing so makes Rachel’s image of the Cuban boy and his bicycle not so foreign: although the caption tells us its Cuba, the brick setting and the attention he gives to his video game does not distinguish him from many other boys around the world. So while certain symbols in this image tell the viewer that this woman is in New York City and not in Paris, Cairo or even Barcelona, a cursory glance would not tell the entire story. Upon first look she appears to stand alone. But the lens of globalization tells us she’s not. She’s inevitably linked to women moving about the busy streets of the world, taking a step in her same shoes and ultimately reshaping the society within which they all stand. What touches me most about this image is not the bike, which comfortably rests near this young boy, and is not the game which he devotes the majority of his present attention to. But it's his white tennis shoes neatly tucked below the cuffs of his pants that draw my eyes in. We can imagine that these same shoes were at once one with the pedals of the bike, propelling him down a bumpy Cuban street and finally propping him up when he and the bike came to a complete stop. Like the bike and the game, the shoes speak of movement - the movement of people, of ideas and of cultures. Globalization makes this possible. The picture does not tell us how far he had to travel to find this comfortable nook to entertain himself. And we can only imagine how far these precious items had to go to find him in Cuba. Nonetheless, this photograph is a powerful reminder of the reach of globalization and its ability to facilitate contact with distant and diverse people and objects. One wonders whether the tides of globalization will make it so that this image and the boy's shoes no longer touch us, but both fold into well-known views of our modern world.